An Ayurvedic Baby Rash Cream For Baby..
Himalaya HERBAL Baby Cream (extra soft). Tube Filling 10 to 50 gm : 3 rs/ Pic50 to 70 gm : 4 Rs/pic70 to 150 gm : 5 rs/PicWhich included our man power and utility from our side rest you can send you as actual cost of material. It is enriched with wheat germ oil & Vitamin E. It naturally conditioning to baby skin prevent it from dryness & make skin healthy. 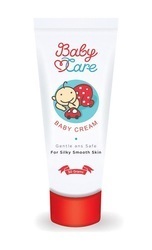 Baby lotion help to moisturize the baby skin & keeps it smooth & soft. It is non greasy, light & fast absorbing and suitable for all season. Himalaya’s Diaper Rash Cream promotes effective healing, soothes red and irritated skin and forms a protective layer on baby’s skin. We manufacture the best quality Baby Nappy Rash Cream that is made up of quality material and is very useful for the babies as it Prevents nappy rash and is a soothing relief to the rash area. Maintaining our synchronization with the latest industrial evolutions, we are engrossed in delivering an exceptional consignment of Baby Cream.